Who but Werner Herzog would end a documentary on cave paintings by wondering what a radioactive albino alligator thinks of them? 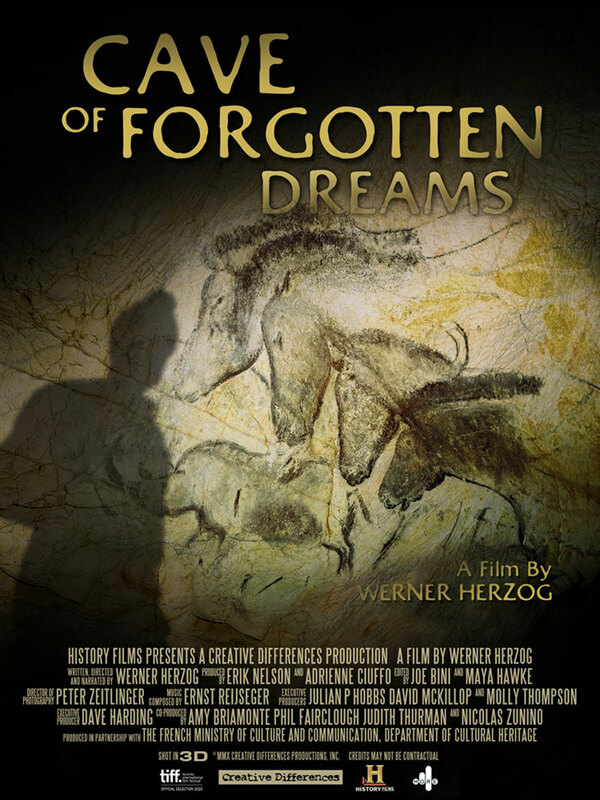 The alligator in question doesn't even live in the Chauvet cave in southern France that Herzog and his small film crew document in CAVE OF FORGOTTEN DREAMS. He's 20 miles away in an artificial tropical environment created by water heated at a nearby nuclear power plant. Perhaps Herzog really did see some connection between the pale reptile and the cave paintings. More likely, though, he was merely intrigued by the creature, and so found a way to include it for his own satisfaction. Of course anyone familiar with Herzog's films knows that he likes to go off on tangents. That's part of the fun. But Herzog never strays so far that we lose focus of his film's real star. That would be the Chauvet cave itself, and the paintings that adorn it's walls in amazing quantity and state of preservation, offering an unprecedented look into the lives and inner thoughts of our ancestors. Because the conditions are so fragile and the significance of the site so great, only a few scientists and art historians have been allowed inside until now. Herzog is the first, and could very well be the last person granted permission to film in the cave. It is for this reason he decided to shoot in 3D, so that as much as possible the experience of seeing these paintings, which often incorporate the natural curves of the cave walls, could be captured and shared. I understand where he's coming from, but my honest opinion is a 2D presentation would have been preferable. There are a few interviews with experts that help put the significance of Chauvet cave into context. Herzog also finds time for a digression into one scientist's prior career in the circus. For the most part, though, we are simply shown the cave and its contents in as much detail as could be managed given the severe restrictions on time and equipment the crew had to work under. Herzog narrates the film himself, and his voice is hypnotic as he contemplates the paintings. Some seem to depict movement, suggesting to Herzog a primitive form of the movies. The play of light and shadow in one room reminds him of a prehistoric Fred Astaire dance routine. The image of a woman's naked hindquarters merged with a buffalo's head is similar to other early religious artifacts discovered around the world. And perhaps like the alligator mentioned at the start of this review, some of these paintings are merely a reflection of an individual artist's interests and whimsy, preserved for the ages first on the cave walls, on now on film. I understand that for some, watching CAVE OF FORGOTTEN DREAMS will be like watching paint dry, except that the paint already dried thousands of years ago. Hopefully I've provided enough information in my review to figure out if that's you or not. For those still interested, this is a chance to see something truly amazing on film that very few will never get to see in person, and having Herzog as our guide makes for a nice bonus. 3 1/2 out of 4 stars.